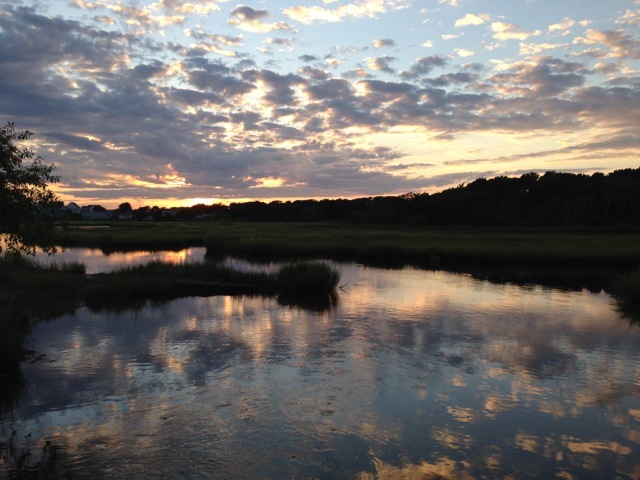 Note: This sunset was in West Dennis, Massachusetts, on Cape Cod. I may not have had internet connectivity on my mini-break, but I had connections to the clouds, sunsets and stars. 🙂 I got home, and my internet connection is spotty, and loading webpages nearly impossible. I will try to visit you when we have solved this new problem. Have a wonderful week ahead, my friends. Perfect combination, with the beauty in the sky and the fun in a child’s giggles, too! Smiles! I hope I always remember that sunset, it’s such a good memory. 🙂 My children were laughing. We were all fascinated by the horseshoe crabs and the zen seabirds. An alchemical recipe – nicely done. Thanks, I was thinking of Belinda when I took them. 🙂 I didn’t want her to feel obligated, though. Perhaps she will eventually see them. She loves them! You are the sweetest!